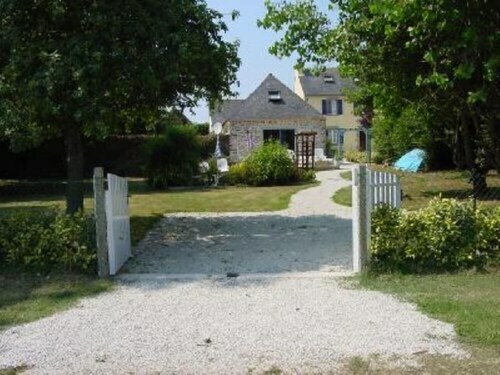 Located by the ocean, this family-friendly vacation home is within 6 mi (10 km) of Chapelle Notre-Dame-de-Bonne-Nouvelle, Plage du Ris, and Eglise St-Ronan. Sables Blancs Beach and Menez-Hom are also within 9 mi (15 km). Located in the heart of Quimper, this hotel is within a 15-minute walk of Musee des Beaux-Arts, Cathedral of Saint Corentin of Quimper, and Jardin de la Retraite. Cornouaille Theatre and Museum of Earthenware Quimper are also within 1 mi (2 km). Quimper Station is only a 2-minute walk. Located in the heart of Quimper, this hotel is within a 10-minute walk of Cathedral of Saint Corentin of Quimper, Musee des Beaux-Arts, and Jardin de la Retraite. Cornouaille Theatre and Museum of Earthenware Quimper are also within 1 mi (2 km). Quimper Station is 9 minutes by foot. How Much is a Hotel Room in Sainte-Anne-la-Palud? Hotels in Sainte-Anne-la-Palud start at $49 per night. Prices and availability subject to change. Additional terms may apply. Sainte-Anne-la-Palud has an extensive range of places to stay. Within a 6-mile (10-kilometer) radius of the main area of Sainte-Anne-la-Palud, visitors can choose from 11 memorable hotels. Travelocity-listed accommodation options that are close to the town center of Sainte-Anne-la-Palud include the Relais du Silence Manoir de Moëllien and Hotel Latitude Ouest. 10 miles (17 kilometers) from the main part of Sainte-Anne-la-Palud, you will come across the Relais du Silence Manoir Hôtel des Indes. The Manoir de Kerhuel is situated 14 miles (23 kilometers) away. The Hotel Et Bistrot Du Bac and also the Villa Tri Men are two other recommended places to book accommodation around Sainte-Anne-la-Palud. Would you like to travel a little bit further afield? Brittany is home to many impressive things worth checking out. Explore Brittany's castles. Those who love nature should leave time to enjoy its beaches and coastal plains. Daring travelers can also love mountain biking, cycling and picnicking in the region. Quimper is 13 miles (20 kilometers) to the southeast of Sainte-Anne-la-Palud and features Quimper Cathedral and Musee des Beaux-Arts. When you want to stay in Quimper, be sure to check out the Best Western Kregenn and Hotel Gradlon. For another option, stay in Benodet, 20 miles (32 kilometers) to the southeast of Sainte-Anne-la-Palud, where you can pick from the Hotel Ker Vennaik and Relais Thalasso Bénodet - Restaurant and Hôtel Kastel. If you visit Benodet, a couple of sights worth adding to your itinerary are the Benodet Beach and Relais Thalasso Benodet. Just because you and your traveling partners are far from home, shouldn't have to mean you can't enjoy your obsession with sport. Stade du Moustoir is 50 miles (79 kilometers) to the southeast of Sainte-Anne-la-Palud. Sleep surrounded by the action at the Mercure Lorient Centre Hotel or the ibis Styles Lorient Caudan. Look up Travelocity's thorough Sainte-Anne-la-Palud city guide to learn about the great cultural and scenic attractions the city offers.